Between April 2016 and May 2017 I worked on and off as a 3D generalist for film and television production company Bigger Bang on a project for their client, Planet3. 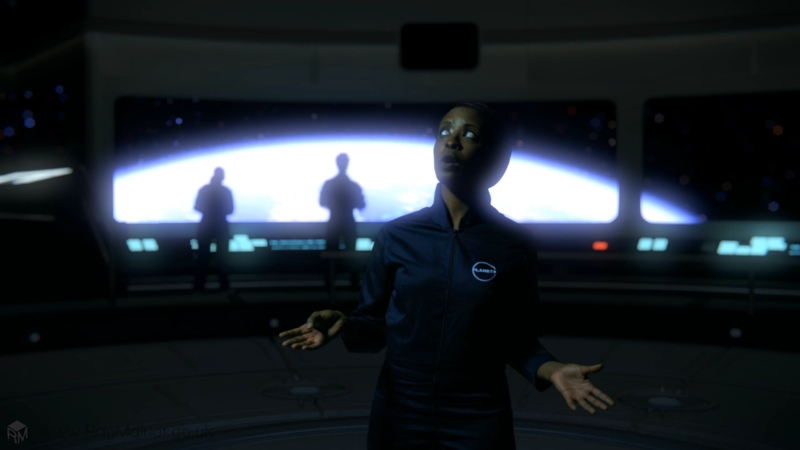 The project was to create a series of educational science films serving as introductions to levels in a game by Planet3, wherby the presenter - an actor filmed on a greenscreen - would introduce a scientific topic by interacting with and creating graphics around them, all from the Planet3 Orbiter in orbit around earth. My role was to assist Nathan Williams (producer and 3D artist on the project) on 25 shots for the production, which I was responsible for taking from the provided graphics script up to the final renders using Blender 3D, with each shot focusing on different scientific concepts (often with interaction from the greenscreen actors) such as weather, climate, ecosystems and cells. To begin this project we needed a template file to host all of the shots we would be making. Communicating with Nathan, who liased with the client, I created a ready-to-render file that myself and others on the project could use as a basis for all the shots we worked on, which included the spaceship interior in which all shots are set and a flexible compositing setup. 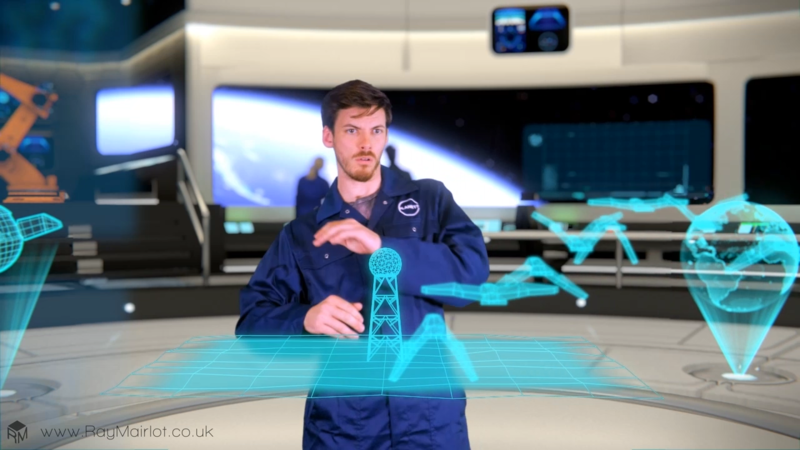 The template included holograms, animated robots (including two animated by Nathan), working 'scientists', flashing sci-fi equipment, ships flying by the window and the panoramic view of Earth. 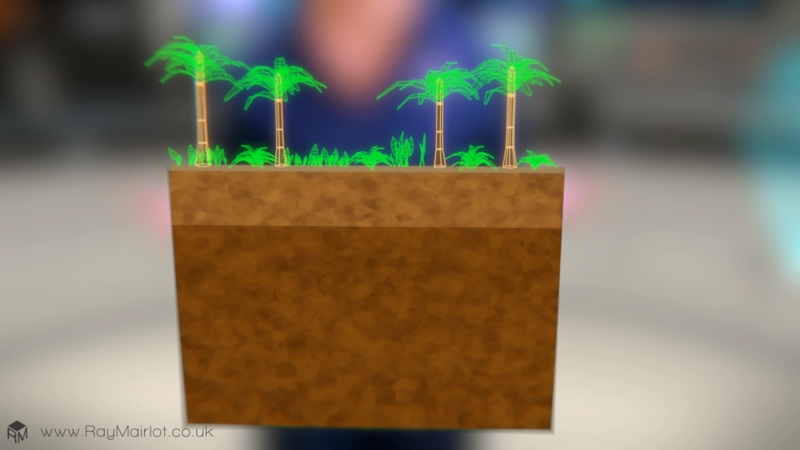 The template also eventually included several custom add-ons for Blender 3D which I wrote to assist in the animation of composited layers and to control the template's animated elements. A diagram of a Eukaryote cell and it's organelles. 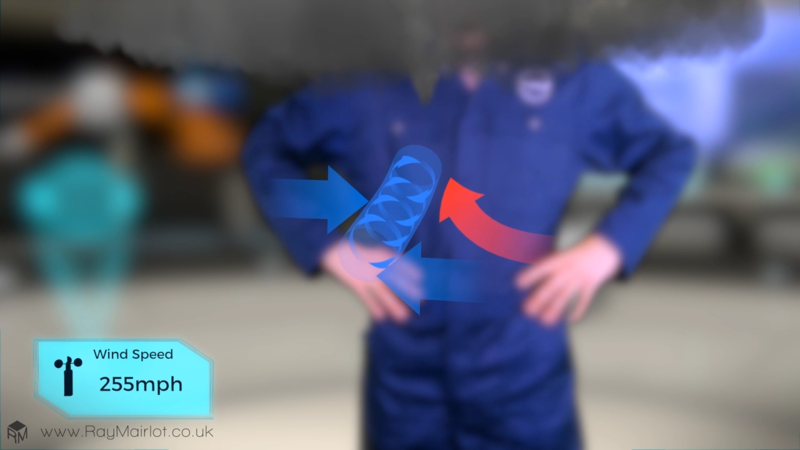 To explain more complex processes, like the formation of coal or geothermal power plants, we created this 2D diagram style where we show a 'cutaway' of the scene. This wireframe effect was used throughout all the diferent shots for a feeling of visual consistency and also helped with the tight schedule as we were not aiming for realism. 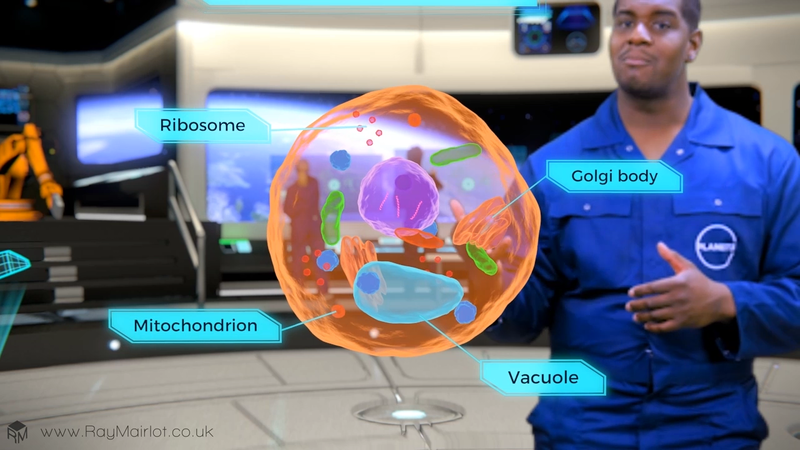 Some of the types of effects I had to create were: Chemical reactions; explanations of scientific equipment, such as Doppler radar; weather sensors; tornados; energy flow; geysers; geothermal power; microbes; ocean currents; rain and snow; robot animations; Greenscreen actors interacting with on-screen graphics like spinning globes, screens and graphs; holograms and flocks of birds. My favourite shot; rain splashes on the lens as a pesky robot messes with the atmosphere controls in the Planet3 Orbiter. The idea was that all the graphical elements appearing around the 'presenter' were holograms that were being created as they were needed, so we drew some of the elements as wireframe objects to enhance the idea that they are computer generated. We took this idea further by using a chromatic aberration effect to give the sense that the holograms were real and therefore susceptible to imperfections. 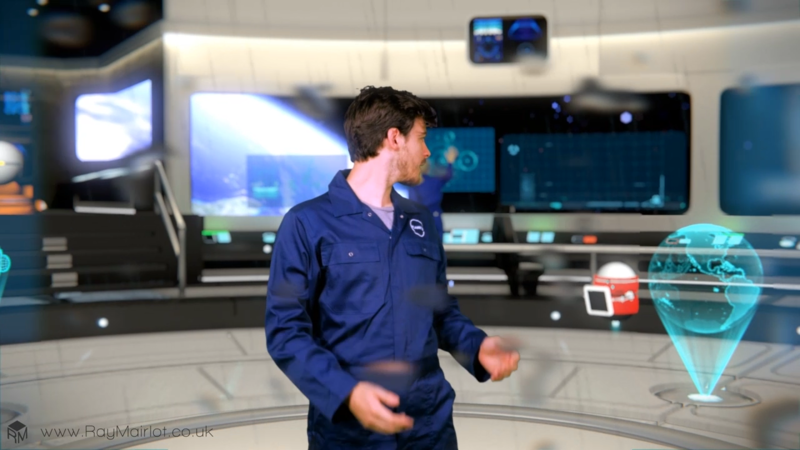 An example of the presenter interacting with the graphics as they bat away a flock of holographic birds flying towards them. Visual consistency was important to make all the shots feel part of the same series. This was helped by having the same setting for each shot - the Planet3 Orbiter - and continued by having a standardised style for text and text boxes and diagrammatic arrows. Planet3 also advised us on text usesage and fonts to comply with their style-guide. In the main template used for all the shots, the lighting in the ship is baked (precalculated) into the textures, allowing fast render times, even in HD. However, this 'lights-off' version, only needed for part of one shot, required a custom setup to allow the screens and sci-fi panels to illuminate the dark scene which wasn't possible by default. This effect would eventually be contolled with a Python add-on, allowing a checkbox to turn the lights on or off. The challenge of this project was the tight deadline, but we were helped by our initial investment in setting up templates and good defaults for shots, even if some of those defaults, like robot rigs or lighting setups, had to be expanded as the client reacted positively to them and asked more of them than had initially been anticipated. While the schedule was tight, it was great to work on a project that required such a variety of work to be done, from physics simulations, modelling, animation and compositing to Python scripting and the result was a series of consistent shots that were fun to work on and that the client was very happy with.